Groups of rabbits living TOGETHER? That's right. 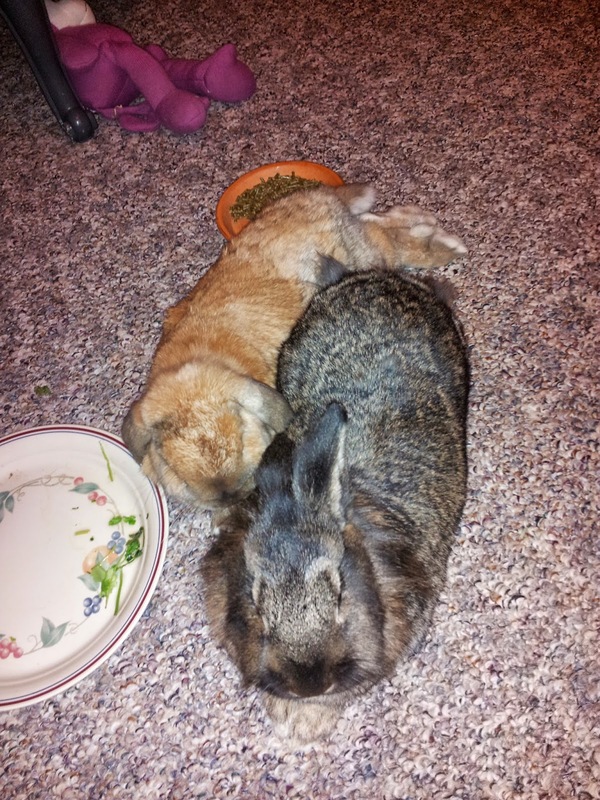 This blog tells the stories of people who are slowly integrating their bunnies into one peaceful, happy, multi-rabbit household. It's designed as a sort of ongoing reportage about how they're doing the bonding, and how it's going at various stages along the way. 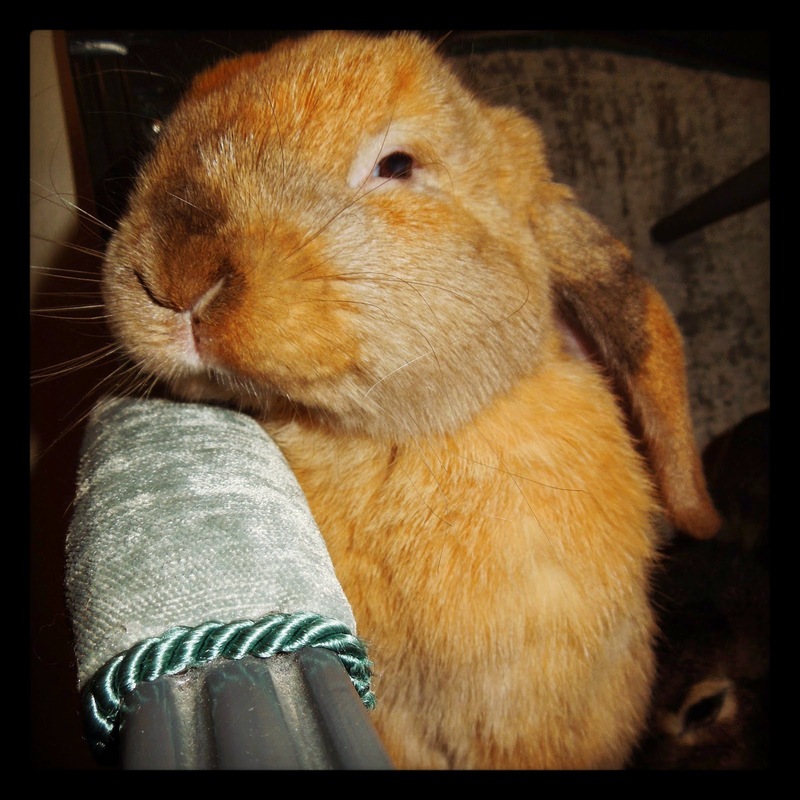 One of the reasons I created this blog was because there aren't a lot of online sources talking about bonding and living with multiple rabbits together, especially not groups of three or more. So, here are listed some of the best ones I could find. If you know of others, please post them in the comments. Sam and Dan have settled into married/bonded life quite well. They share everything now and go everywhere together. It's almost as if they have an invisible tether connecting them, they never go very far from each other. I cannot say enough how thankful I am for this. How thankful I am for these bunnies. Sam and Dan have brought so much joy to my life. They have taught me so much about love. I had never had my own pet until I got Sam. I was 23. I never thought I could possibly become so attached to an animal. I thought those people who really loved their pets were weird. I just had no idea. I had no idea how much love a small furry creature could give you with one look or nuzzle. I had no idea the comfort I would find just in their presence. I had no idea how proud I could be when my abused and battered babies thrived and grew. I had no idea how much my heart would grow when the boy who can barely bathe himself struggles to give his adoring bunny girlfriend a bath. I may have rescued these bunnies from horrible lives, but they rescued me too. These last 2 years were so hard for me personally. I went through a devastating separation and divorce, lost almost all my possessions and money, lost my home and got diagnosed with a debilitating disease. But I persevered. I crawled back out of the darkness. I moved halfway across the country and started all over again. At 27, I hope I have gained some wisdom from my mistakes. Through it all Sam has stuck with me and loved me no matter what. I know it sounds stupid, but I couldn't have done it without her. When things were so dark and I didn't know how we would make it out, she gave me strength. I don't know what took me so long to finally take the leap and adopt another rabbit, but I am so glad we did. She and I are so much better for it. Dan just constantly reminds me of the power of perseverance. We have been through so much heartbreak, the three of us, but we have come through it happier and healthier. We are ready to fill our life together with as much love and happiness as possible. We'll get to that title. A couple of days into our bonding staycation we hit a little bit of a rough patch. Up until this point Sam and Dan had been playing, snuggling, eating and causing mischief together without any problems. I was so happy and proud of the bunnies for adapting so quickly. Let me give you a little background on why this happened. As I have said before Dan was in terrible physical shape when I got him. He had congenital malocclusion (which for all you non-rabbiters reading this, it's when their front teeth grow out of control and basically make all mouth related activities impossible) and his jaw had also been broken at some point when he was a baby, before I had him. Even though I had his teeth fixed to enable him to eat and drink easier, he has a very hard time cleaning himself. I always joked that he was such a dirty bunny, even though he tried so hard. Sam is extremely picky about cleanliness, and keeps herself pretty pristine. I had been encouraged by my vet that bonding Dan to Sam would improve his quality of life so much, and one of those ways was that Sam would do the cleaning for both of them. And she does, he is so much cleaner now than he was. He looks so raggedy in pictures from before they were bonded compared to now. So back to the fight. 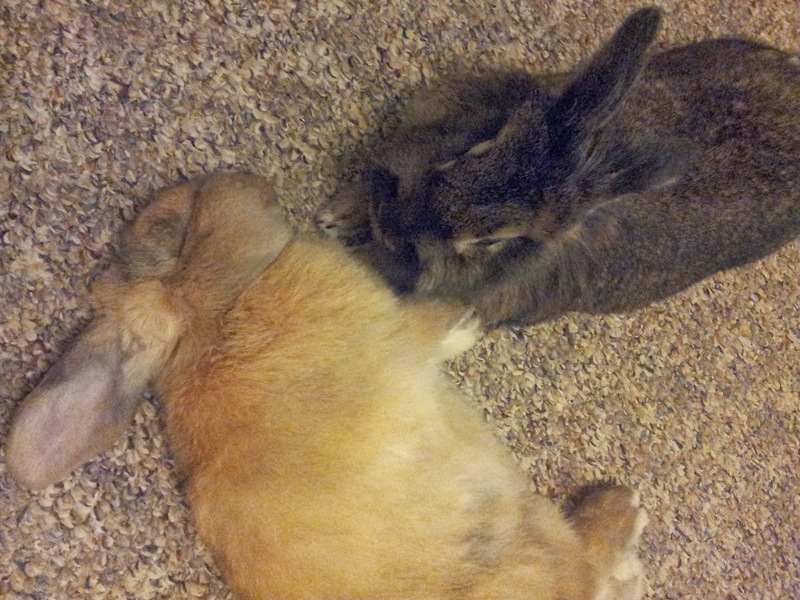 I was playing with the bunnies before bed one night when Sam started grooming Dan as she often did. But she got down by his underside and was really going at it and he freaked out. I don't know if he just didn't like it or if she accidentally nipped him or what. But he started making all kinds of crazy sounds and batting at her and flailing his body around. Sam just hunkered down on the floor and didn't move. I pushed her out of the way with my hand and picked him up away from her. He was twisting his body all over and just throwing a fit. I had never seen him or any rabbit act like that. I held his paws in my hand and cradled him close to my body (I didn't want him to hurt himself, and I couldn't put him down because I didn't know if he would go after her). I talked softly to him and he calmed down within a minute. The whole time Sam sat at my feet and looked up watching us. She didn't run away or act scared, but she was worried. As soon as he had settled down I bent down and gave her some reassuring pets and talked to her while I kept Dan tight against my body. After about 5 minuted of this, I sat down on the floor with Dan in my lap. Sam sat down right next to us while I continued to pet them both. After another couple minutes they were touching noses with each other across my legs, so I decided to put Dan on the floor and see what happened. In the words of my main man Kenny Rogers "You've got to know when to hold 'em, know when to fold 'em, know when to walk away, know when to run". And I didn't think the bunnies were a threat to each other anymore, so I took a chance. They immediately started licking each other and then Sam ducked her head down under Dan's and they snuggled in together. After about a half an hour of watching them snuggle, I ran upstairs and grabbed a book and a pillow so I could hang out with them until I was sure they were fine. After a couple hours I went to bed. I considered separating them for the night, but decided not to. They had never shown a single aggressive behavior to each other in the past, and Dan had never even so much as looked at me in an angry way, let alone fight. Also, it appeared to just be a misunderstanding, and Sam had not fought back in any way. It was a judgment call I had to make. They have never fought since. *You must remain calm. Even when you are freaking out inside, you must stay calm. Keep your voice and movements steady and gentle. I am positive this is what helped diffuse the situation so quickly. *Protect yourself. Thankfully I was wearing long sleeves when this happened, so I only got a couple minor scratches. But only because Dan doesn't have teeth to bite with and Sam was not fighting back. For regular rabbits be careful breaking up a fight with your bare hands, it is not a good idea. Keep gloves or a pair of shoes nearby to slip on your hands if you have to. *Keep a watchful eye. Until you have had at least a week of no incidents between your rabbits, check on them frequently. In fact, spend as much time with them as possible so you can encourage good behavior when it happens and referee their interactions. *Know when to stick it out. Remember Kenny Rogers. Try to realize when the bunnies just need some attention before you automatically call it quits. Bonding is hard work, and sometimes you have to literally get down on the ground and stick it out with them. To this very day in March, Sam and Dan have never had another fight. Never even batted at each other or made a disgruntled noise. They spent the rest of their bonding time at my parents in total harmony and rode home in the same cage together. They are a fully bonded pair now. I have one more post to share some photos of their life together now and wrap everything up. If you have any questions about bunny bonding please ask! I would love to help in any way I can. If you're thinking about bringing a new bunny into your existing bunny household and would like to be considered for Bunny Meets Bunny's next "Guest Poster" opening, please email us and tell us a little bit about yourself. Cat Meets Bunny and Dog Meets Bunny! 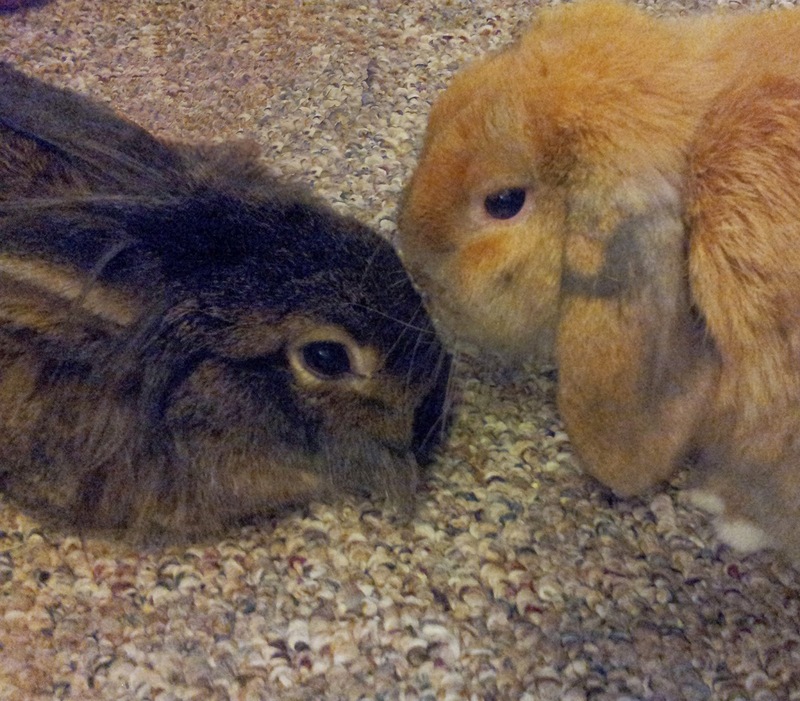 For more information on bonding multiple rabbits, see the House Rabbit Society webpage.